The site of Tell Šēḫ Ḥamad is situated on the eastern bank of the Khabur-river in north-eastern Syria, close to the Iraqi border. During the Late Bronze and Iron Age it was an Assyrian provincial center with the name Dur-Katlimmu, situated about 230 km from the Assyrian heartland with the capital cities Assur, Nimrud and Nineveh on the Tigris-river. Due the general political situation in Iraq since the 1970s, archaeological field data from the central area of Assyria along the Iraqi Tigris mainly come from earlier excavations in the pioneering days of the exploration of ancient Mesopotamia and rarely fulfill the standards of modern excavation techniques and methods of documentation. In contrast, the mission directed by Prof. Dr. Hartmut Kühne, Freie Universität Berlin, in Tell Šēḫ Ḥamad, was able to conduct a modern large-scale and long-term excavation from 1978 until the outbreak of the Syrian civil war in 2011. The work was financed by German Research Foundation before the funding came to an end in 2013. Fig. 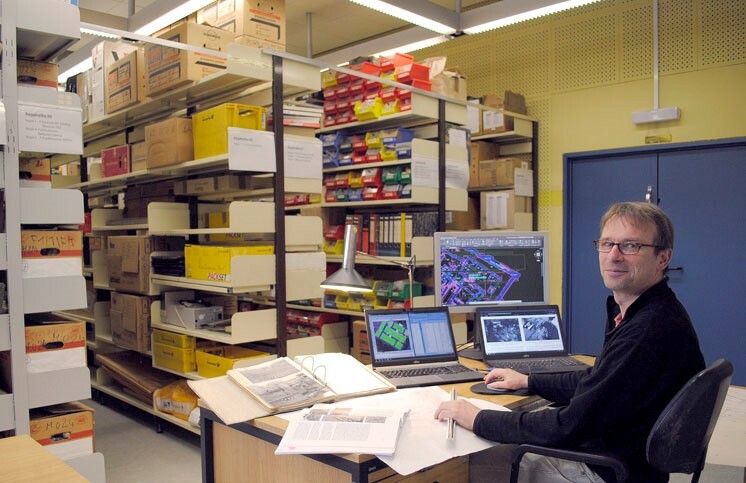 1: Jens Rohde in the Tell Šēḫ Ḥamad Archive of the Freie Universität Berlin (March 2019). 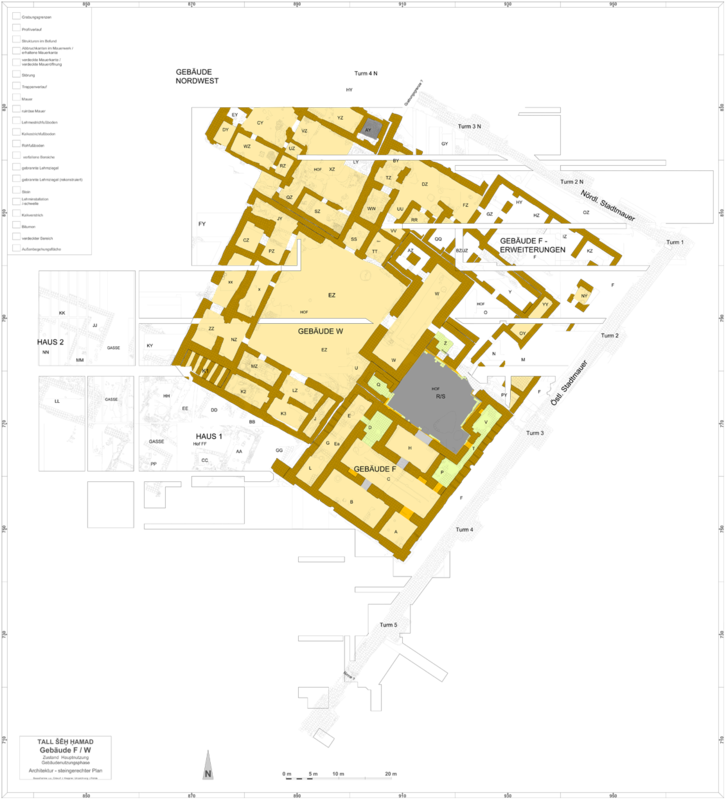 As part of the research portfolio of the Alexander von Humboldt-Professorship for the Ancient History of the Near and Middle East, Prof. Dr. Janoscha Kreppner pursued the analysis and processing of the north-eastern corner of the so-called "Unterstadt II" ("Lower Town II") of Dur-Katlimmu from August 2015 until his appointment by the WWU Münster on October 1st, 2018. In cooperation with Janoscha Kreppner, now in Münster, Jens Rohde (fig. 1) has since September 2016 been creating a highly accurate digital plan of the site (fig. 2). Fig. 2: Preliminary result of the plan of the north-eastern corner of the "Unterstadt II" of Dur-Katlimmu (March 2019). The study focusses on the stratigraphy and architecture of the excavated area in the northeastern corner of the city where approximately 10,000 m² have been explored in the large rectangular Lower Town II, an addition of the early first millennium BC (intramural area ca. 52 ha). A section of the urban layout was exposed, featuring five separate buildings, open areas, the town wall, and a system for fresh water supply. The multifunctional palace-like Building F/W is the largest and most important, covering an area of 3768 m² and consisting of almost 50 rooms. The goal of the publication project is to explore the changing cityscape and Dur-Katlimmu’s social and administrative structures and mentalities by drawing on the rich data yielded by the excavations in this area. Fig. 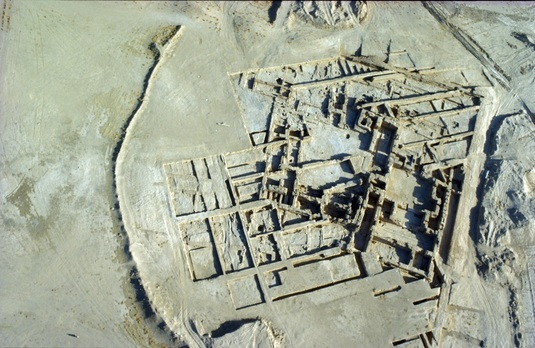 3: Aerial view of the excavation of the north-eastern corner of the "Lower Town II" of Dur-Katlimmu from 1990. The project is funded by the Alexander von Humboldt Foundation from August 2015 to July 2020.